Leading Manufacturer of parking block, wheel stopper, wheel lock, parking blocks for shopping malls and car wheel lock from Faridabad. Available under model no APB-1, these Parking Block are offered under block size of 500x160x125 mm and find suitability in parking lots. 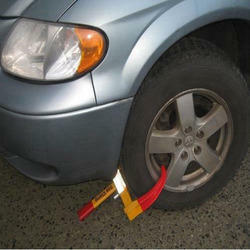 Offering support as vehicle blocking mechanism, it helps in stopping rolling of the vehicle once it is parked against it. 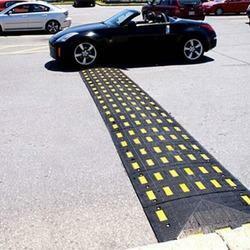 As simple blocking mechanism, these are like speed bumps other than the height which is taller. Further, its superior design also protects low bumper vehicles as well as is also makes it more durable in use. We can also offer it with choice of highly reflective tape that comes embedded in blocks for better night time visibility. Some of its advantages include suitability for use on any road surface, suitable for indoor/outdoor parking, long-lasting in use, provides for maintenance free use for years and safety from wrapping, cracking and chipping among others. Available under model no APB-2 and in block size of 500x160x110 mm, these Wheel Stopper can be offered by us in different size choices as per the specific preferences of the customers. 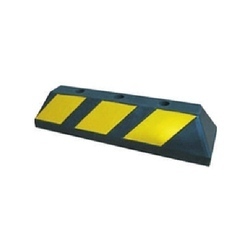 Available in different color options with support of painted color and reflective tape for better night time visibility, these blocks are also perfect to be used in parking garages, parking areas and loading docks. Here, our expertise also lies in custom developing these blocks with flexible usage support even on uneven surfaces. 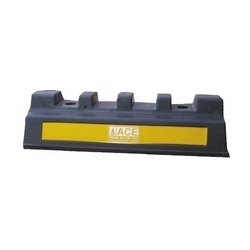 For strong embedding to the surface, we can offer the blocks with long steel spikes or the short lag bolt options. We offer latest technology based Wheel Lock support that provides for optimum protection for different types of vehicles including cars. 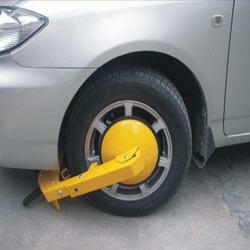 Available in easy to lock designs, it supports the need of parking enforcement. Further, this anti theft device helps in immobilizing movement of vehicles as well as at the same time ensures superior structural integrity for years to come. With superior hardened and tempered finish, these anti-theft wheel locks can also be designed for use on buses, trailers and trucks where these fit on vehicles of different wheel sizes. Some of the standard features of the product include easy to use construction finish, soft grip handle support, protective rubber wheel clamp tip to safeguard damage to tire, resists cutting and sawing attempts among others. We are offering a wide assortment of Parking Blocks for Shopping Malls. These products are widely demanded by the clients for their precise performance. Moreover, our products are featured with sturdiness and high tensile strength due to which they are able to get repetitive orders from the clients.